Your water heater plays a huge role in the comfort of your home, from providing sanitation in your kitchen to warm baths and showers. Water heaters need to be maintained or serviced occasionally, when you feel that your water isn’t getting as hot as it should, or if it doesn’t last as long as it used to. The repair team at Reliable Plumbing & Heating Services has experience with every type of water heater on the market, and can fix your problem in a timely, cost-efficient way. Whether you need an inspection, repair, replacement, or new installation, we have the solution. Our customers have a number of different types of water heaters available to them, and our team is more than happy to go over the pros and cons of each. We understand your time is important, and always arrive on site with a fully equipped truck to perform any duty you need without rescheduling. Maintaining routine service can lengthen the life of a water heater, and keep it functioning at full capacity – reducing the risk of total system failure or inconvenient breakdowns. Hidden problems can be taken care of right away, instead of waiting for them to become larger issues. 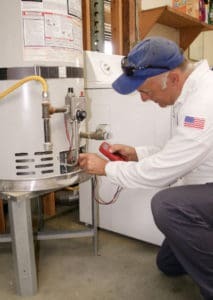 If you want your water heater inspected by a team of professionals in the Monterey, CA area, contact Reliable Plumbing & Heating Services today. Our water heater team is trained to tackle every kind of repair or installation service you might need, big or small. With superb customer service, a two-year warranty on parts and labor, and top-notch technology to back us up, you can have peace of mind when it comes to your water heater. Call us today at (831) 394-7077 to speak with one of our friendly representatives about your water heater, and discover how Reliable Plumbing & Heating Services can help. Our focus is providing outstanding, reliable plumbing service with 100% satisfaction guaranteed. We can handle all of your plumbing and heating problems properly and efficiently. Saturday service is available at no extra charge.